Enjoy extra storage in your kitchen or dining room with this classic-style cabinet by Baxton Studio. Two roomy storage cabinets and one counter-height open shelf help you stay organized, and the top cabinet features a glass-paned door, making it easy to find what you need. This Baxton Studio Traditional White Wood Kitchen Storage is perfect for our small kitchen in our cottage, it was relatively easy to assemble it by myself without my husband in one hour. Nice Average Item, Decent Quality. It's a nice item, it's not the best quality, but it's also not the worst. Overall, it's easy to assemble, except the door knob screw wouldn't fit tight and keep coming loose, so I had to re-order the part which Overstock took care of it. Assembly was easy but instruction is just so-so. Overall, compared to other things I bought from Overstock, this is not one of the better cabinets, but I'm satisfied as the price justifies the quality. Poor quality for the price. The packaging was good; the bottom section between the two front legs had a piece broken. The entire unit is made of particle board. The Cams are not metal. I think they are plastic made to look like metal, or just really thin metal., The cams would crack and/or break as they are tighten. I assemble all our furniture that needs assembly, so for me it was fairly easy. (I am female). The instructions are not really defined (but what are now days?). I was expecting better quality for the price and size of this unit. I ordered 3 and sent back 2 as I didn't want to take apart the one I assembled. it took way too much time for us to put the pieces together. the holes were not aligned. the instruction sheet was confusing. but once it's set up, it looks nice. This cabinet looks great in our kitchen. We didn't have a lot of room and needed a smaller cabinet. It fits perfect. The assembly was easy and the quality is good. Wish I had room for more, I would buy another one. 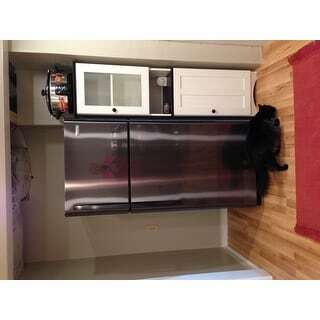 This is great storage for a small kitchen because it is tall and thin, but putting it together was difficult. Some of the things that need to be screwed in do not have pre-drilled holes or spots marked, so there is some guess work. This shelve and cabinet unit was Easy to put together with instructions provided and beautiful sturdy piece of furniture for the price you can’t beat it! I have a small kitchen with not much cabinet or counter space so it’s perfect for my coffee maker and Tupperware and anything else I want to declutter off my counters. Moved into a new place with a much smaller kitchen that we are use to. This was an excellent fit. A good Saturday afternoon project for me and my husband . Parts fit well and directions was clear; the results was just what I wanted . I will buy more product from designer; the price was right . I can't review it yet as I'm still putting it together, but I need a little help. The instructions do not clearly show how to install the glass using the brackets. There are no visible guides on the window frame. Help? A nice piece. Needs to be anchored so it won't topple. Smaller than you'd think, could be deeper. Need to know how to put things together for this one. 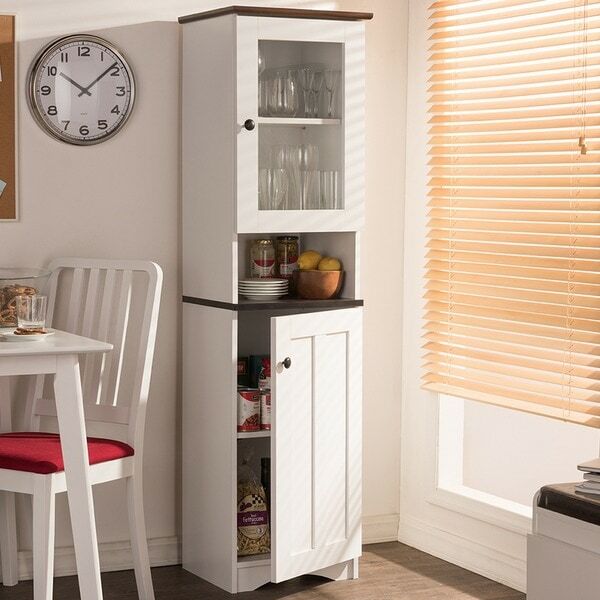 This cabinet is a great buy as far as space, great look and a good fit for the corner of my kitchen. The glass is the show piece. The hardware is not cheap and is a great accent. It looks nice. The instructions were very hard to follow because they were shrunk down so far I had to redo a step or two so that was frustrating. Would rather it be bigger and electronic. But it looks nice and gives me a place to keep stuff I don't use often. Purchased 2 of these, returning the un-opened box. Not sturdy at all, looks like a child's piece of play furniture. Very disappointed. This piece of furniture is exactly what I needed for my little space. I’m super glad the doors are interchangeable to open or close on either side. The finish is pretty and I adore the glass. That sold me. Pretty straight forward to assembIe. I guess my only dislike, it appears a lot taller in the advertisement. I didn’t need tall. It’s exactly what I wanted. Highly recommended. Will serve its purpose and feels sturdy enough. Putting it together was another story. The instructions could have been better and a few pieces were labeled wrong. I do recommend using a glue on all of the chipboard and wood pegs. Also, have a clamp ready if you are by yourself trying to put this together. The clamp will help to square it up while putting on the back. Overall it was okay. A lot of the pieces were pretty scuffed up/dirty when they arrived. The directions for putting it together are not the best but I have to admit I’m not a pro furniture builder. Once together it was a little wobbly but it’ll serve its purpose. "How much does the cabinet weigh?" "Can the doors be switched around to open on the opposite side?" "What is the hight of the bottom shelf (floor to top of bottom shelf)? Thank You!" "I want the telephone number of overstock.com"
Please contact us at 1-800-The-BIG-O (1-800-843-2446) for immediate assistance. "What are the dimensions of the hole between the cabinets?" "How do you attach the glass to the door? There are no pre drilled holes on the door for the screws that are provided."